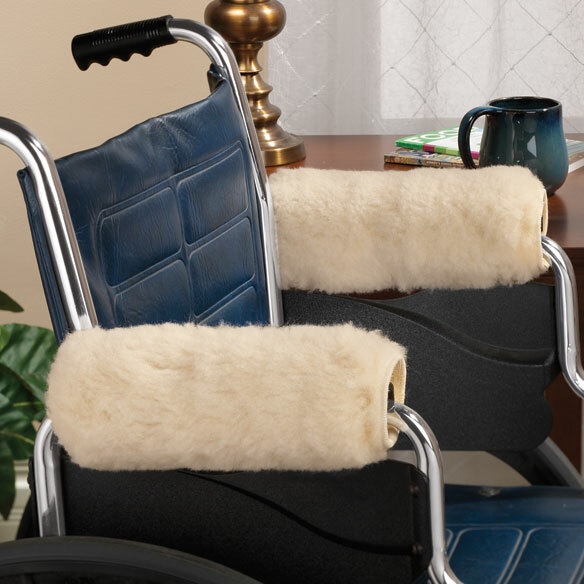 Add soft comfort and coziness with a set of super-plush polyester shearling wheelchair arm covers from Easy Comforts. Each wheelchair arm cover is designed to attach securely, using hook-and-loop closures for easy, non-slip placement. The sherpa wheelchair armrest covers comfortably cushion and support arms, reducing discomfort, stiffness, and friction. Give your loved one the gift of a sherpa armrest for wheelchair comfort, enhancing their everyday quality of life. Standard metal or plastic wheelchair armrests are transformed into luxuriously soft, comfortable cushions with the addition of these high-quality covers. Sherpa wheelchair arm covers are ideal for both short-term and permanent wheel chair use, and can easily be removed from a wheelchair or transferred to another. When ordering your sherpa armrests, please specify the side you prefer: Small (measuring 10” long) or Large (measuring 14” long). Each package contains one pair of armrest covers. Machine washable for easy care. Made in the USA. Sherpa Armrest Covers are a Blessing! Purchased these arm rest covers for my recliner with narrow, wood arms. It has made all the difference - I love them. My arms are so much more comfortable and don't end up with "dents" in them from long use. This ia for my Aunt who is in a wheel chair ar all times. Thank you. Wish I had purchased sooner! The arms on my wheelchair and my computer chair are hard and cold. These are soft, warm and comfortable. I wish I have bought them sooner. Love them. Thanks for the great products. This product is perfect for the arms of my wheelchair. It helps make them softer and helps prevents my arms from sweating. Leather armrests deteriorate quickly and these armrests are the most comfortable you can buy! Love it. Helps so my atms dont sweat like they do on the vinyl. These Sherpa armrests are just what I have been looking for! I am more than pleased with them Exactly what I needed and so grateful for finding them and having such a great outcome! I lean on my elbow when at desk using a nebulizer while also on the computer. This has caused elbow to become quite sore. This lambswool pad cushions my elbow perfectly which is helping to heal the sore. They keep my arms comforatble when I am at my computer. I would recommend them to anyone that needs some support under their arms when sitting in a chair with arms to rest your arms on. Aids in the discomfort of the elbow's pressure on an imovable arm. I do not use them on wheelchair . I USE THEM ON BARSTOOL ARMS THAT ARE METAL.IT HELPS. I bought the armrest covers for my husband for his wheelchair. He likes them very much. I got these for my husbands electric wheelchair. They are very well constructed(made in USA) and he loves them. However, they are not big enough around for the arms on an electric wheelchair....I went ahead and used Velcro to widen them and they work perfect! I'm purchased these to help keep the armrest from cracking. More comfort for my husbands arm and hands on his wheelchair. I am wheel chair bound after major surgery. My arms seem to get the brunt of lifting and moving. My 98 year old friend is in a wheelchair 24/7 and has very sore shoulders. Can't raise her arms very much. I believe she will be more comfortable with these sleeves on the arms of her chair. original armrest is showing wear and needs "help"
Need replacement for cracked arm rests on wheelchair. Item is needed at a reasonable price. For arm comfort in my wheelchair. Tape on the tears would not hold. My mom's wheelchair's existing arm rests were very worn & this protected her thin arms from the rough edges. Actually much less expensive than replacing the arm rests, too. needed for my computer chair arms that are worn. I have ordered these arm cushions before for my husband and my mother. It makes a soft place for arms instead of the hard wheelchair arms. in their stores. I have been a client of Easy Comforts for a while now but do not order very often. I do like their products as I am helping take care of my mother-in-law presently. To cover bed rail arm post. My wheelchair arms are cracking and peeling and I also think this would make it more comfortable. To help Mom stay comfortably upright in her wheelchair. My Aunt is in a nursing home. She sits in a wheelchair most of the day. Hoping this item can give her comfort. To ease pain for an elderly woman's arms n elbows. I hope the closure will work on the arms of her wooden chair. Need it for my office chair! Needed for my wife's wheel chair for comfort. My arm is getting sore on the arm of my wheelchair and this may help with the soreness. What is the difference between small and large? BEST ANSWER: Thank you for your question. The small is 10" long and the large is 14" long. We hope this information will be of help to you. Can these be used for motorized wheel chairs? BEST ANSWER: I use mine on my motorized chair and they don't close all the way around,but I improvised and added Velcro extenders and works great. Yes, however if you have controls mounted on your arm rest, you may have to modify that side. What is the width of the wheelchair arm covers? I need it for wide arm electric. BEST ANSWER: Thank you for your question. The Small/10”is 8.25” circumference and the Large/14”is 8.5” circumference. We hope this information will be of help to you. What is hook and loop fasteners? BEST ANSWER: I ordered these and it's just Velcro fasteners. Good product and fits perfectly on my w/c. They're washable and worth the money. BEST ANSWER: Thank you for your question. Yes they are machine washable. We hope this information will be of help to you.